“Designer Voice” Denise Kelly has been recording and performing local, regional and national TV and Radio commercials and Promos across the country and around the world since her high school days. Denise loves the varied aspect of the work in VO: “I'll record hard-hitting news Promos for TV in the morning and Radio imaging for an English-speaking radio station in Japan in the evening”. You’ll also hear her contemporary, bright voice on promos for KMBC TV in Kansas City and in the award-winning nature documentary series “Refuge”. Her adventurous life matches pace with her versatile voice; Denise enjoys wine tasting trips and watching Hockey games, and has two rescue cats. 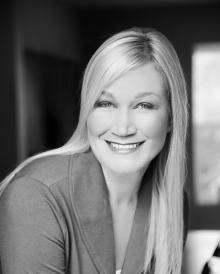 Denise Kelly has been recording and performing TV and Radio commercials and promos for over a decade. You’ll hear her distinctive, accomplished, luxury sound as the voice of many TV and Radio stations across the country and around the world. Clients include Cirque du Soleil, Madonna, Mutual of Omaha, Prudential, Sara Lee Bread, Allegiant Airlines, Jif Peanut Butter and many more. ISDN, Source Connect Standard and phone patch available.